A canoe tripper could spend a lifetime exploring Algonquin Park. Covering approximately 8000 square kilometers (3500 square miles) of rugged Canadian Shield country, “The Park” is home to an abundant and diverse wildlife population, unspoiled lakes and rivers and spectacular scenery, all found in a unique forest environment – the meeting place of northern conifers and southern hardwoods. 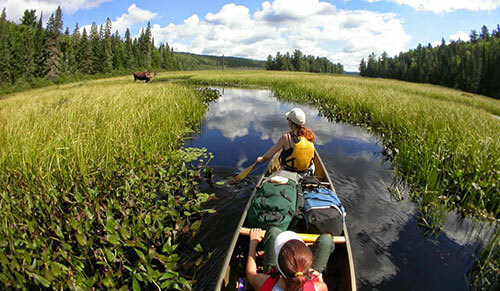 Over 1600 km (950 miles) of canoe routes follow lakes, streams and portage trails through the vast interior. Campsites and portages are marked and maintained. Fly-in access is prohibited. Motorboats are restricted to a few lakes and road access to the park is limited to the Hwy. 60 “corridor” and peripheral access points. As a result, most of Algonquin Park is only accessible by canoe. Backpacking and day hiking trails allow travel on foot. In the winter, the park is open to travel by ski, snowshoe and dog sled. If Algonquin Park isn’t on your bucket list already, it should be. Click the “Our Outfitting Packages” button below to learn more about Algonquin Outfitters canoe trip packages, or use the menu to the right to explore our group trip packages, guided trip packages or information on planning an Algonquin Park canoe trip and canoe trip rate charts. Algonquin Outfitters is well known for having experienced, knowledgeable staff, lightweight canoes and high quality equipment. From planning to packing, Algonquin Outfitters can help with every aspect of your canoe trip. 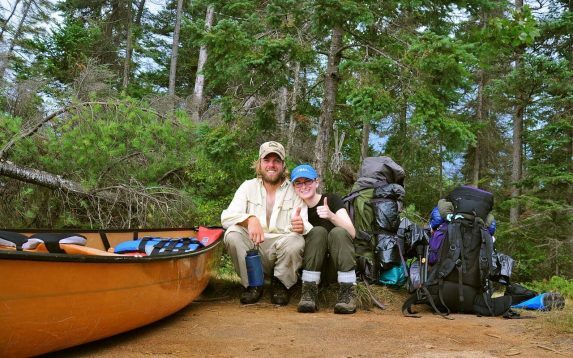 Whether you just need to rent a canoe, or get completely set up with all the food and equipment, Algonquin Outfitters can meet your needs. Our Outdoor Equipment Rentals (Partial Outfitting) allows you to rent just a canoe and/or extra pieces of equipment. Booking an Overnight Trip Package (Complete Outfitting) for a canoe trip lets you show up with just your personal gear and find all your food and equipment ready to go – ideal for people without the time, experience and/or equipment to put together their own wilderness trip. Our packages include all the camping and canoeing equipment you need for an enjoyable trip, as well as a nourishing, delicious menu designed for wilderness travel. The most valuable part of our service is the training, advice and help that our experienced guides and outfitters will give when custom tailoring your trip, route and equipment to your abilities and interests. Provided for no extra charge, this service is just one of the things that makes Algonquin Outfitters one of the finest outdoor adventure stores in North America. You can even bring this service along on your canoeing experience by hiring one of our guides to accompany you on a custom guided canoe trip. If you don’t feel quite ready for venturing into the park interior, 12 drive-in campgrounds offer visitors a slightly different camping experience. Most are along the Hwy. 60 corridor, with easy access to park facilities, day trips by canoe, walking trails and other activities. There are picnic areas, beautiful sand beaches, hiking trails and some amazing scenery to be seen. You don’t have to be an expert canoeist, or even a camper, to enjoy Algonquin Park. Many people stay at local lodges, motels or resorts and enjoy short excursions. Full and half-day canoe, kayak and bike rentals are available at Algonquin Outfitters for day outings. Our guided day trips are the perfect way to get a taste of what a longer trip might be like. No matter what season or for what reason you visit Algonquin Park, be sure to visit Algonquin Outfitters – your outdoor adventure store!